Bridge Baron is one of the oldest and most popular computer bridge games and it is also one of the easiest to use. However, ease of use can be a dual-edged sword and often prevents used from seeing all of the features that Bridge Baron has to offer. This book attempts to to lift that veil and demonstrate how Bridge Baron can be used by both beginning and advanced players not only to play bridge, but also to learn the game, study the game, practice with partners, compete in tournaments and more. Every feature and option in the Bridge Baron is covered explicitly. 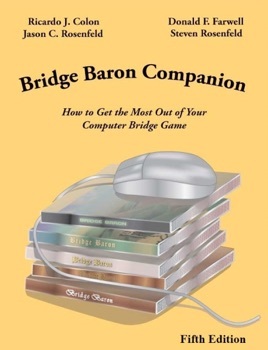 If you are new to Bridge Baron this book will help you get up and running quickly; if you are a long-time user, this book will point you to parts of the program you may not have previously explored and help you to use Bridge Baron to improve your bridge game. The Bridge Baron Companion book also includes notes on Bridge Baron's various bidding systems and a detailed explanation of every convention that Bridge Baron plays and how the Bridge Baron plays it.